The Lady Rams took care of business on the second day of the Eastern Semifinals at the College of Charleston and secured the win. Rachel Bryer and Hannah Scanlon were dominant in A division with a 9 point win over 2nd place Boston University in the 9 race series. Sarah Hermus with Kate Nota and Marisa Decollibus had their best performance of the season in B Division finishing 3. NEISA rivals BC and BU were 2nd and 3rd. The top 9 in the 18 team field will move on to the finals which start the following day. The Western Semifinals were won by Yale with Brown and Coast Guard 2nd and 3rd. These 6 NEISA teams have battled all year and will certainly dominate the finals. The Lady Rams won the Semifinals last year, but failed to reach the podium in the finals, finishing 4th. This year they are determined to take it to a higher level. Conditions for both days were turbulent, to say the least. Saturdays racing was interrupted for hours by thunderstorms and torrential rain preceded by a period of very strong wind and followed by a near drifter. A 3 knot ebb current was a feature for much of the day followed by a tame flood. After racing the skies opened again to more torrential rain and thunderstorms. There were only 4 races in each division. Sunday began with a fresh southerly and sunny skies, but the radar was promising that things would change and they certainly did. The last A set was shortened to a single race so B could get a race before the skies opened up. The breeze built rapidly ahead of the storm with gusts near 30. The Eastern Semis finished about A? hour before the Western Semis and their last B race became a demolition derby with gusts over 40 and many capsizes. 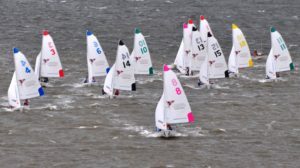 Complete scores can be found at http://scores.collegesailing.org/.